We have our new RS200 National Champions! The awesome team at Tenby Sailing club who delivered a superb championship – we will be back! Ben and Amy managed to just hold off a rapid Jonny and Sarah, although there were some nervous moments for them when the spinnaker hoisted and the clew and tack were tangled together at the end of the pole. In the closely fought battle for 3rd to 10th, Maria and Rob smashed the right corner, some would say “rang the bell” to take third , just in front of Ed Whitehead and Millie Alcock and Alistair/Helen. .
After day 2 it was clear to see that the light wind practice and cocktails of Café Flambé (hence “The Flambé Bullets” consisting of Ben and Amy, Maria and Rob, Hamish and Emma) in the hot sunshine of Lake Como for the RS Eurocup had paid dividends as they locked out the top three on the scoreboard. It is well worth a trip to Carnac next year – for sunshine, excellent racing and of course some cheeky Nationals practice on holiday! After what turned into a big night for some last night (Tom McLean/Tommy Darling/Syd McLean et al) where karaoke followed from Julian’s questionably intellectual quiz, the sailors arrived early to the boat park for a three race day. 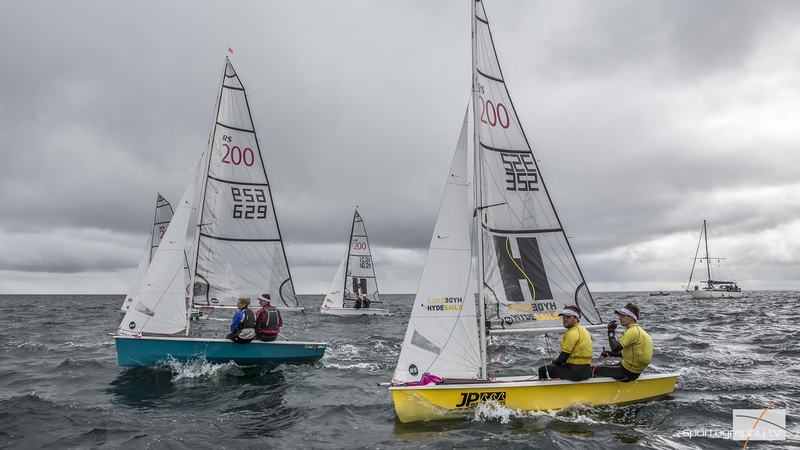 Race 5 was swiftly started with Caroline Croft/Alex Warren as the pathfinder and after one recall the race was underway in relatively light winds. It paid to bang hard left up the beat to make use of the shift. At the sailors’ request the first beat was made longer so those who chose the left were set up nicely for the race. Race 5 was won by Jonny and Sarah McGovern. 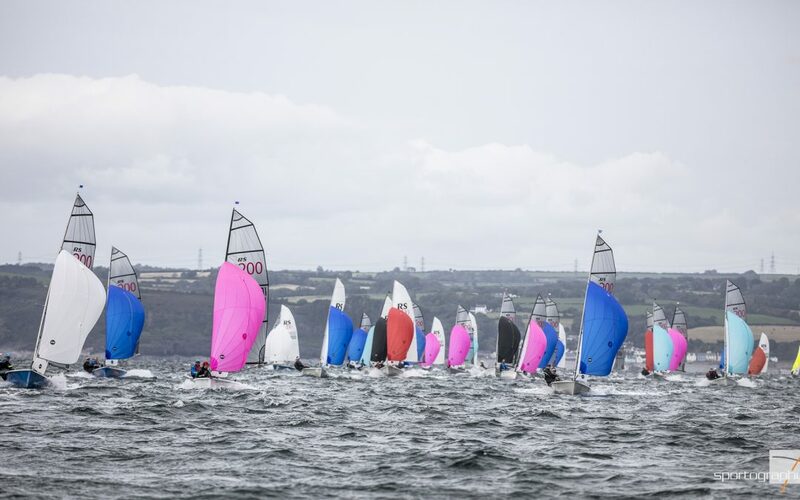 Race 6 was turned around very quickly as it started to get later into the day and sailors were anxious to get ready for the night’s big social – Under the Sea fancy dress!! 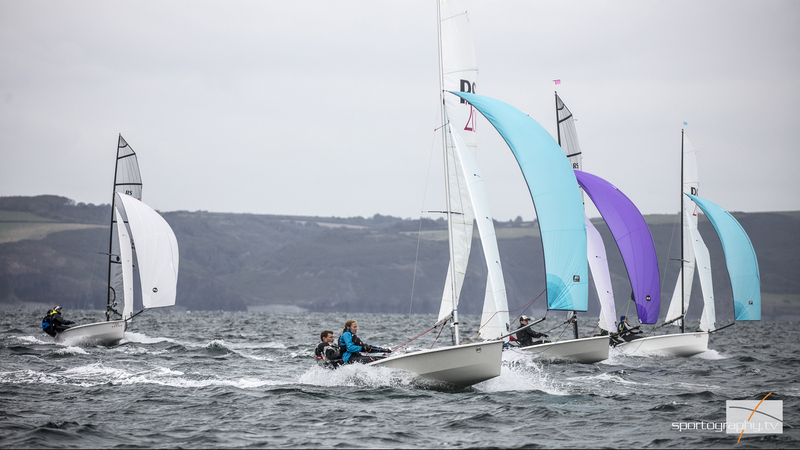 It paid to play the shifts and have good boat speed for this race which was shown by Hamish and Emma who won with it being shortened to two laps by the race officer who clearly took pity on the sailors. We all know the arguably most important race is the race back to shore/showers/the bar so many sailors seemed to speed in to get their fishy costumes on ready for tonight’s social. Race 8 saw Ben and Amy show the rest of the fleet how to execute a gate start and pick a shift to take the championship lead overnight. Tom and Lucy Hewitson sailed their socks off to help Hayling Island Sc’s bid for the club prize in 2nd, while Georgie and Dan Vickers knocked in a brilliant 3rd. Ben and Amy are deserved and popular champions. Ben has sailed 200s for a few years now and fused this experience with Amy’s considerable pedigree on the Olympic pathway to unstoppable effect.